This Rene Caisse video shares the history of this remarkable woman and her pursuit to make essiac widely available to everyone. The trials and tribulations she went through were great--but they are part of why essiac is known by so many people today. Source: Youtube Rene caisse video description. "Essiac is rooted in Native American medicine, specifically, from the Ojibwe tribe in Canada. The reason we know about it today is because of a Canadian nurse named Rene Caisse. 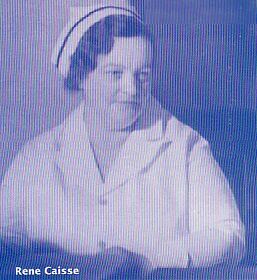 In the mid 1920′s Rene was working as head nurse at a hospital in Ontario. The story goes that one day she noticed scar tissue on an elderly patient and when she inquired about it, the woman told her it was from breast cancer, but it had been healed by a recipe given to her by an ojibwe medicine man. This was amazing to Rene because back then cancer was a virtual death sentence. The woman was almost 80 years old and the cancer never came back. She told Rene the names of the herbs she used. Over a year later, Rene learned that her aunt had cancer in her liver and stomach and had only a few months to live. Rene talked to Dr. R.O. Fisher, her aunt's doctor, about the herbal tea and he agreed to try it since there was nothing else he could do for her. Rene's aunt went on to live another 21 years after being deemed untreatable by the medical community. Word spread about her aunts miraculous recovery and soon, doctors were asking to try her tea on other hopeless patients. Many recovered and even among the worst cases, the tea improved their conditions enough to ease their pain and allow them to live several months longer than doctors expected. Rene went on to open a clinic where she treated thousands of people with her tea free of charge. You would think the people in charge of our health care would be interested in this wonderful gift... And they were, but not interested in researching and administering it but in suppressing it. The Medical establishment has fought essiac since day one. It is a threat to their profits. The herbs literally grow like weeds and the tea can be made by almost anyone with a kitchen. A cheap cure for cancer shuts down a multi billion dollar industry On October 7th, 1926, 8 doctors signed a petition to the Department of Health asking that Rene be given opportunity to officially research and prove the effectiveness of this tea. This brought the attention of the Canadian government and started a long drawn out battle over the fate of Rene's tea. In 1938, a bill was introduced to the Ontario congress that would allow Rene Caisse to officially practice medicine and treat patients with essiac. Along with this bill was presented a petition with over 55,000 signatures. The 59 members of parliament voted and the bill was just 3 votes shy of passing!" Click here for our most popular order of essiac tea that provides six months of tea at the aggressive dose.